Some television moments are made in comedy heaven and this is one of them, Matt Lucas (Little Britain) will be making a legendary guest appearance in the smash hit comedy series Kath & Kim, screening Sunday, November 11th at 7:30pm on 3. The show, a huge hit both in New Zealand and Australia, was launched in Britain in 2005 with a resounding applause from the general audience when 1.6 million people tuned in to watch the premiere episode. Lucas, a huge fan of the series, filmed his guest role, for which he had to dress in drag, when he toured Australia with his Little Britain comedy partner David Walliams earlier this year. Lucas is perhaps best known for his acclaimed work with David Walliams in the hit television sketch show. Little Britain plays heavily on memorable catchphrases which have become ingrained in playgrounds and offices around the UK. Lucas plays, among many others, four of the most popular characters in the series, which he writes and acts in along with David Walliams. In May 2007, Lucas was placed eighth in the list of the one hundred most influential gay people in Britain, in fields as diverse as entertainment, business, politics, and science, by the British newspaper The Independent. In this episode entitled “Roots” Kel (Glenn Robbins) is desperate to find out if he’s a nob with noble blood. The search into his family history leads Kath to find her own family skeleton in her closet and Sharon discovers a long lost sister, Karen (Matt Lucas). It seems that this sister takes after Sharon in the eating department and with that much hilarity ensues! 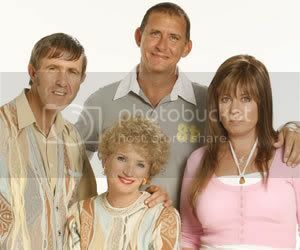 Kath & Kim recently made their own guest appearance on Matt and David’s documentary about their Aussie tour on Little Britain Live. Don’t miss this hilarious guest appearance from Little Britain’s Matt Lucas in this week’s Kath & Kim, screening Sunday, November 11th at 7:30pm on 3.